City: 13 – Hwy: 21	Actual rating will vary with options, driving conditions, habits and vehicle condition. 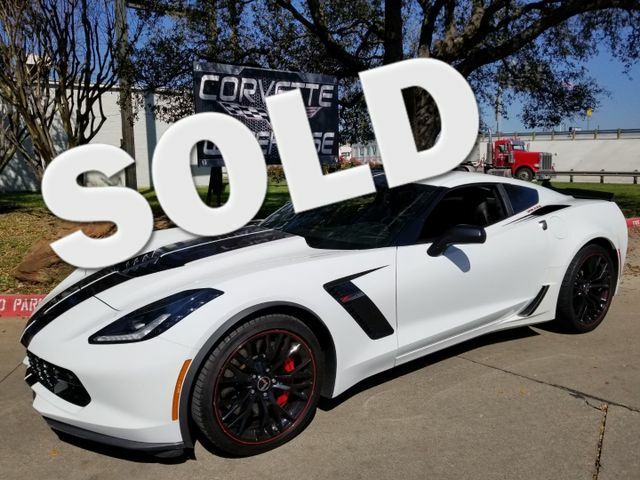 2015 White / Jet Black Leather Chevrolet Corvette Stingray Z06, 7-Speed Manual Transmission, 3LZ Option Package, Removable Top, Sport Seats, Navigation System, NPP Dual Mode Exhaust, EYT Carbon Flash Pkg, UQT Performance Data & Video Recorder, and the Z06 Black Alloy Wheels with only 77k Miles! This 2015 Z06 comes equipped with 2LZ Option Package, 7 Speed transmission, cd player, power windows, power locks, power mirrors, keyless entry, removable top, sport seats, navigation system, NPP dual mode exhaust, carbon flash package, UQT performance data & video recorder, and the Black Z06 Black Alloy Wheels. It is in excellent showroom condition and has been highly maintained.